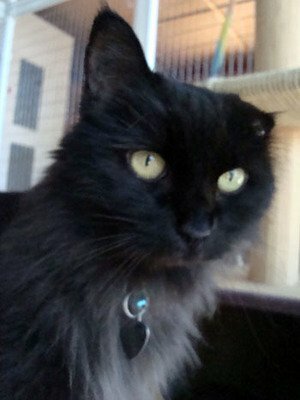 Shadow, a longhaired cat, is available for adoption near Atlanta, GA. Shadow is an 8-year-old Domestic Longhair with tough times behind her, hopefully. Abandoned and previously injured, she lost the tip of one of her ears due to an infection that was never treated. Fortunately, she was found by a good Samaritan who treated her ear and brought her to Atlanta Animal Rescue Friends. Despite her tough past, she has lost none of her sweet personality and has so much love to give. She is a great jumper and a curious little lady, but her favorite place to be is on your lap or cuddling under your chin! She is brave about meeting new people, is great with children, and is a pro at using the litter box. Shadow is available for adoption through Atlanta Animal Rescue Friends in Tucker, GA.